Guy and Edna Ballard on the Cure for Political "Isms"
Attracted by the spiritual message of the fast-growing "I Am" movement, throngs again crowded the Civic Opera Building yesterday. There they heard Mr. and Mrs. G. W. Ballard, the "Accredited Messengers" of the faith, expound their doctrines and tell how light rays emanating from "The Mighty I Am Presence" can set the world aright. Most of those who attended yesterday, according to attendants, also were there Friday. Men, women and children from every walk of life, they sat entralled or stood and repeated the instruction given by the Ballards from the platform. "The basis of our belief," Mr. Ballard said, "is that all substance is made of light. Hate, greed and wrongdoing contaminate the body and cause all of the world's ills. One who frees himself from evil may receive the Great Cosmic Light which flows from the Great Presence and be able to accomplish any good purpose thereby. "There are in this world two kinds of beings, mortals who live their lives and a few hundred years later are re-embodied to live another life, and Ascended Masters, those who were mortals but have been purified by the Light and escaped from our mortal sphere." These are the teachings, the Ballards say, of Count Saint Germain, historically a figure prominent in the courts of Europe in the eighteenth century and known as "The Wonderman" because of his mysterious origin and his supposed magic. 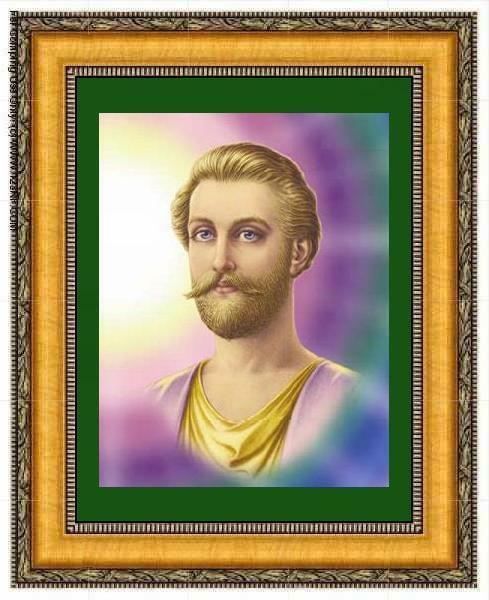 "It is the same Saint Germain," Mrs. Ballard said, "but until now the world has not known in truth who he was. We know he was much more than they dreamed of back in the time of the French revolution." 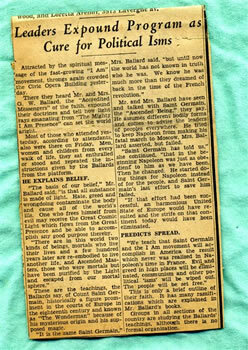 Mr. and Mrs. Ballard have seen and talked with Saint Germain, the "Ascended Being", they say. He assumes different bodily forms and comes to advise the leaders of peoples everywhere. He tried to keep Napoleon from making his fatal march to Moscow, Mrs. Ballard asserted, but failed. "Saint Germain has told us," she continued, "that in the beginning Napoleon was just as obedient to him as we have been. Then he changed. He started doing things for Napoleon instead of for the people, and Saint Germain's last effort to save him failed. "If that effort had been successful, a harmonious United States of Europe would have resulted and the strife on that continent today would have been eliminated." "We teach that Saint Germain and the I Am movement will accomplish in America the result which never was realized in Napoleon's time in France. Evil and greed in high places will be eliminated, communism and other political "isms" will be wiped out. The people will be set free." This is only a brief outline of their faith. It has many ramification which are explained in Mr. Ballard's books. Groups in all sections of the country are studying the Ballards' teachings, although there is no formal organization.